sisu: "Terrorists have an understandable fetish for aviation"
"Terrorists have an understandable fetish for aviation"
"And they were both naked, the man and his wife, and were not ashamed. Genesis 2:25 (King James Version). "And I said, Oh that I had wings like a dove! for then would I fly away, and be at rest." Psalm 55:6 (King James Version). Bill Leak cartoon from The Australian. Blowing up a widebody jet or turning it into a flying bomb does not just kill hundreds or thousands, it resonates fear in a way other forms of mass slaughter cannot. And something like a Boeing 747 represents so much about modernity that Islamic radicals simultaneously love and hate, from Western technology to freedom of movement. Security measures such as those introduced in the past two days make sense in the short term, but also feel a bit like shutting the gate after the horse has bolted. At this stage, it appears that the plot was uncovered thanks to the sort of global surveillance of communications and financial transactions that is often treated as a violation of civil liberties. If this is the case, it serves as a sharp rebuke to critics of the Society for Worldwide Interbank Financial Telecommunication [SWIFT] database program. Also claiming credit for heading off the attacks is Pakistan, which arrested several suspects over a week ago. But Pakistan is part of the problem, having long maintained a two-faced attitude towards the war on terror that has had it talk tough while allowing al-Qai'da and Lashkar-e-Toiba to operate within its borders and cross to and from Afghanistan . . . We should not shy away from calling Islamic terrorists what they are. The fact that George W Bush was taken to task by some Muslim groups for referring to Islamic fascism is disheartening, for the fifth column of terrorists within that faith are as dangerous to ordinary Muslims as they are to everyone else. Muslims in the West should be encouraged to do their part and not let radicals hide behind their communities or let advocacy groups hijack their sympathies. Finally, those who would link the latest plot to the present conflict in the Middle East miss the broader narrative that has had radical Islam replace communism as the totalitarian rival to Western [see Blair's Law, via Tim Blair]. Bojinka and 9/11 were conceived (as were a string of successful attacks of the 1990s) when American foreign policy under Bill Clinton was going in to bat for Muslims from Bosnia to Somalia to the Palestinian territories. Likewise, plans for the first Bali bombings were drawn up before Australia joined the coalition of the willing. Around the world, Islamic terrorism has as its ultimate enemy the freedoms we enjoy, whether they are the ability to get on a plane and travel anywhere in the world or lounge on a tropical beach and enjoy a beer. In their place, it would impose a violent theocracy as anathema to the hundreds of millions of Muslims who treat their faith as a private confession as it would be to everyone else. Those on the Left who succumb to the totalitarian temptation and romanticise terrorists as freedom fighters must understand it is the freedoms they most cherish that Islamic fascists most hate. Those who rallied yesterday in Canberra to "stop the war" and put the onus solely on Israel have things similarly backwards. And cynics who create a no-win situation by claiming the latest British raids were a government set-up and distraction, while blaming officials when terrorists are successful, do no one any favours. For the rest of us, then, the challenge is to keep seeing things clearly and continue living our lives unbowed. *Dinkum – honest, genuine, real (OED) . . . Most scholars believe dinkum was a dialect word from the East Midlands of England, where it meant "hard work" or "fair work." which was also the original meaning in Australian English . . . Fair dinkum means "fair and square," i.e. honest. Can be shortened to "Dinks." We need to figure out a way to screen passengers for intent, not weapons. Richard Reid tried to set off a bomb in his shoes, now we all remove our shoes. So how long before a jihadi lady smuggles something explosive in her bra? What will the airlines make us do in response to bra-bombers? It's a losing battle, screening for weapons. Like trying to fight wrinkles. Can't win that game. 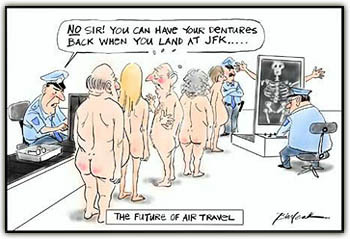 I wish there would be some grand new thinking about airline security. Aussies, aussies, aussies- oy! oy! oy!!! LOL - when I went to pick up my mail from my neighbor, she was telling me that the next step would be flying naked... Love the cartoon. "Bra bombers"?? The whole idea creeps me out. And please, take it no further!